For the Baha'is all over the world, the Ridván Festival is the biggest one all year. Why? Because the Messenger of God for today - Bahá'u'lláh declared during those days that He was the Promised one of all ages. So there, enough reason to celebrate! It is called the Ridván festival because these events took place at a garden called "Ridván". This festival lasts from the 21st of April until the 2nd of May. Roses were Bahá'u'lláh's favourite flower and this garden had an abundance of them. "Every day,... ere the hour of dawn, the gardeners would pick the roses which lined the four avenues of the garden, and would pile them in the center of the floor of His blessed tent. So great would be the heap that when His companions gathered to drink their morning tea in His presence, they would be unable to see each other across it. All these roses Bahá'u'lláh would, with His own hands, entrust to those whom He dismissed from His presence every morning to be delivered, on His behalf, to His Arab and Persian friends in the city." So, remembering those days and the smell and taste of the beautiful fragrance of those roses, we are making this rose water and cardamon cheesecake. This post is part of the collaboration for the "Walking through the garden of Ridván" series. 1. Powderize the cookies and mix with the melted butter. 3. 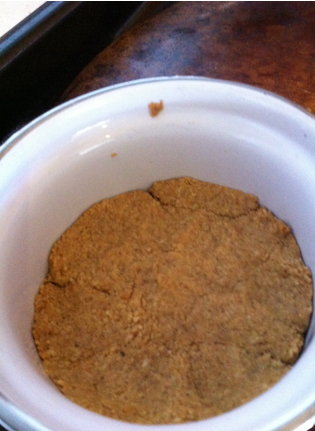 Once the crust is ready, spread on a pie tray and bake at 180ºC for 5-10 minutes until less wet. Remove from oven. 1. Add all ingredients to the blender and blend until well combined. 2. Pour onto the baked crust. Burst all bubbles (if possible). 3. 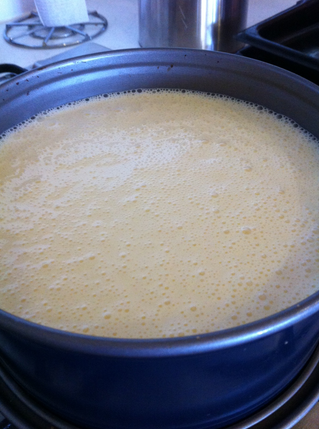 Bake for about 30 minutes at 180ºC. The time will vary so you have to check it and make sure it is not under cooked. To do this you have to shake the pan and if the center wiggles, it needs to bake longer. Let cool at room temperature and then refrigerate. Please note that cheesecake tastes better when it has set so if making for a party or function, you can bake it the night before or early in the morning to allow enough hours for it to set. We will definitely be trying this soon! Thanks for being a part of this series! Dyeing fabric with food items!